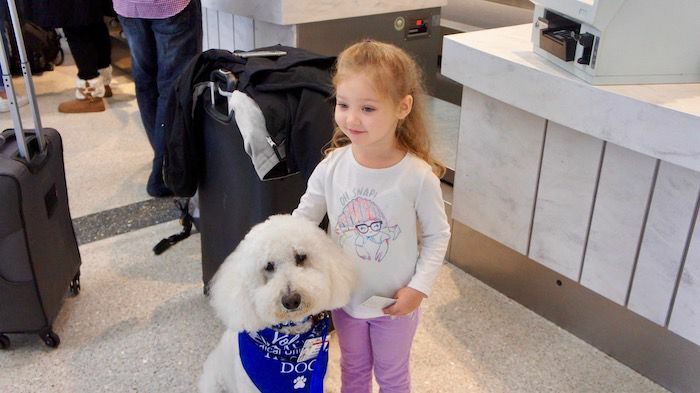 Harley greeted a young travel at the Charleston International Airport. Seven year-old Liam Askari of Mount Pleasant pets therapy dog Harley, while little sister Leila (left) and his mom, Courtney, look on at Charleston International Airport Wednesday. Twenty-two therapy dogs from the Medical University of South Carolina took two-hour shifts from 6 a.m. to 6 p.m. greeting pre-Thanksgiving Day travelers and hoping to relieve some of the stress from their trip. Eighteen month-old Penelope Walsh, from Cincinnati, Ohio, gives therapy dog Reba a kiss after arriving at Charleston International Airport. Traveling anywhere can be chaotic during the best of circumstances. Traveling by air during the holidays can elevate those stress and anxiety levels to new heights. Murphy’s Law and his uncanny timing can show up at the worst of times, especially when you’re trying to catch a flight. Shortages of parking spaces, long lines at the ticket counter or security check-ins and delayed or canceled flights - collectively or individually - are bound to cause blood pressures to rise. Any one of these scenarios - missing or damaged luggage, an already departed connecting flight or lack of available rental cars - can reroute that happy holiday emotion to first class frustration. But for those who travelled through the Charleston International Airport the day before Thanksgiving last year, there was a special surprise waiting. My goldendoodle Harley and his furry friends from the Medical University of South Carolina Buddy Brigade were there to greet everyone from ticketing to baggage claim. Harley is a therapy dog at the Medical University of South Carolina. He and 21 other MUSC therapy certified pups volunteered to hang out and share some puppy love with holiday travelers. Frazzled vacationers were pleasantly surprised from 6 a.m. to 6 p.m. that day as dogs of all sizes and breeds pranced up and down the corridors spreading an abundance of tail-wagging happiness in two-hour shifts. More than 50 airports across the country allow therapy dogs or have a therapy dog program. Canine teams are becoming a common site when traveling by air. Albany and San Francisco International airports each have a therapy pig, and Denver International Airport has a therapy cat on their “canine” team, according to The Post and Courier. Numerous studies indicate interaction with a gentle, friendly animal has significant benefits. Certified therapy dogs are used for physical and mental health, literacy support and physical therapy. Pets can reduce stress, depression and anxiety, as well as help release calming endorphins like oxytocin. Therapy dogs are commonly associated with hospitals and nursing homes, and it's uncommon to see them walking the halls of retirement and hospice homes, or offering aid at disaster relief areas and classroom settings. Beyond airports and medical settings, courthouses are utilizing therapy dogs in court proceedings when preparing child witnesses. Some funeral homes now offer a therapy dog during visitation hours to the bereaved families. The concept of using dogs for therapeutic purposes is not new. In 1982 the American Veterinary Medical Association officially recognized the human-animal bond due in part to hundreds of clinical trials that confirmed what people have known for thousands of years - petting an animal significantly reduces stress and anxiety! Tail Wagging Tutors, a literacy support program, was Harley’s first therapy assignment. Often held in the school library or guidance office, it is designed to help children focus better, improve literacy skills, increase self-confidence, reduce self-consciousness and encourage the love of reading. The 2017 holiday season marked the first time therapy dogs worked at Charleston International Airport. It was also the first time the MUSC Pet Therapy Dogs worked outside of the hospital - where Harley and his MUSC furry friends work primarily with patients and staff. Presently there are more than 48 dogs walking the hospital hallways. MUSC is always looking for a “few good dogs” to join their Pet Therapy program. Visit www.muschealth.org/volunteer/pet-therapy.html to learn more about what therapy dogs do! Cathy C. Bennett is the creator of Groovy Goldendoodles, a pet blog and website centered around her two Goldendoodles, Harley and Jaxson. Visit www.groovygoldendoodles.com.